In this study, we present the lithospheric structure of the south-eastern part of the Iberian Peninsula by means of a set of 2D images of shear velocity, for depths ranging from 0 to 50 km. This goal will be attained by means of the inversion of the Rayleigh wave dispersion. For it, the traces of 25 earthquakes occurred on the neighbouring of the study area, from 2001 to 2003, will be considered. These earthquakes have been registered by 11 broadband stations located on Iberia. All seismic events have been grouped in source zones to get an average dispersion curve for each source-station path. The dispersion curves have been measured for periods between 2 and 45 s, by combination of two digital filtering techniques: Multiple Filter Technique and Time Variable Filtering. The resulting set of source-station averaged dispersion curves has been inverted according to the generalized inversion theory, to get S-wave velocity models for each source-station path. Later, these models have been interpolated using the method of kriging, to obtain a 2D mapping of the S-wave velocity structure for the south-eastern part of Iberia. The results presented in this paper show that the techniques used here are a powerful tool to investigate the crust and upper mantle structure, through the dispersion analysis and its inversion to obtain shear velocity distributions with depth. By means of this analysis, principal structural features of the south-eastern part of Iberia, such as the existence of lateral and vertical heterogeneity in the whole study area, or the location of the Moho discontinuity at 30 km of depth (with an average S-velocity of uppermost mantle of 4.7 km/s), have been revealed. Other important structural features revealed by this analysis have been that the uppermost of Iberian massif shows higher velocity values than the uppermost of the Alpine domain, indicating that the massif is old and tectonically stable. The average velocity of the crust in Betic cordillera is of 3.5 km/s, while in the Iberian massif is 3.7 km/s. All these features are in agreement with the geology and other previous geophysical studies. 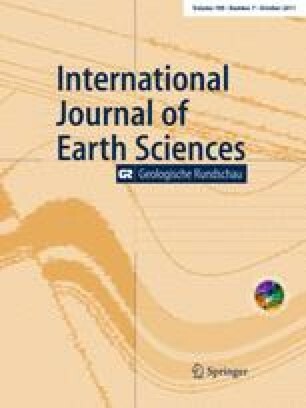 The authors are grateful to Instituto Geográfico Nacional (Madrid, Spain), which has provided the seismic data used in this study. Helpful comments and suggestions from Dr Radwan and other anonymous referee are gratefully acknowledged. This research was partially supported by the Ministerio de Educación y Ciencia, Spain, Project BTE2003-00974 (financed with FEDER funds).